Amazon.com description: Product Description: Perl is one of the most popular scripting languages in use today, a vital tool of experienced Unix system and network administrators and of web site developers. 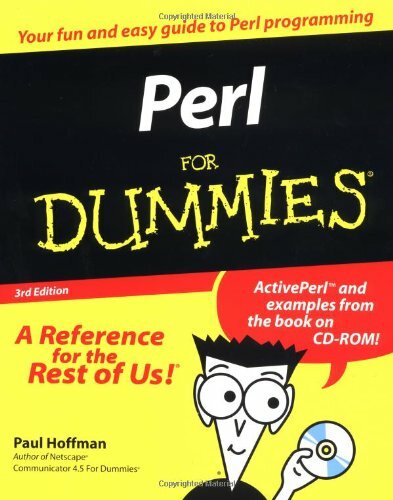 Perl for Dummies gives you all of the tools and instructions you need to begin programming in Perl immediately. The book includes hot tips on using Perl to integrate XML with existing Web data. CD-ROM includes hundreds of pre-written building blocks for creating your own Perl applications. About: Explains the foundations and basic concepts of Perl, and covers topics including CGI, database programming, and Web Services. About: Perl is one of the most popular scripting languages in use today, a vital tool of experienced Unix system and network administrators and of web site developers.